NOTE: You will need a micro Phillips screwdriver to assemble this product. If you have a different version, please click HERE for instructions. 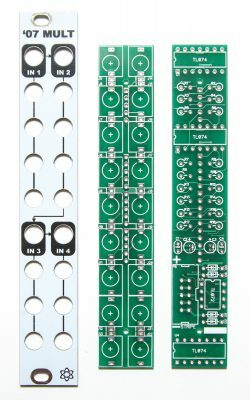 Thank you for purchasing the MST ’07 Buffered Multiple Eurorack module kit! This is an intermediate build. There are some stand-up resistors and a lot of components crowded together. If you feel like you can handle it please proceed! If not, get some help from a friend with experience or purchase a fully completed unit. Start with the diodes as shown below, then carefully flip over on a firm surface to solder, then clip your leads. Diodes are polarized components so you must match the black stripe on your diodes with the white stripe on the PCB silkscreen. The ceramic capacitors are not polarized, so it doesn’t matter which way you orient them when populating. Insert them into their appropriate spots as per the BOM, and then flip your project over on a flat, hard surface and solder them in place, clipping the excess leads. Next up are the electrolytic capacitors. These are polarized, so pay close attention to how they are oriented on the PCB. Insert the longer of the two legs into the solder pad that is closest to the ‘+’ symbol on the PCB. The stripe on the capacitor should be facing AWAY from the ‘+’ symbol. Once these guys are in, flip your project over, solder, and clip any excess leads. Next up are the IC sockets. Pay close attention to the half moon looking notch in one side of the socket, and make sure it matches up with the same notch on the silkscreen. Once they are all populated, carefully flip your project over. A stiff card or another PCB could help with this process. Once you have it flipped over, start by soldering only one leg of each socket. Then check to make sure everything is flat and straight, then continue soldering the rest of the legs. Add 5 and 15 pin male headers to the PCB as shown below and turn over carefully. Start by soldering only one leg of each header. Then check to make sure everything is flat and straight, then continue soldering the rest of the pins. Now we can populate the resistors. Insert each one into its appropriate spot, then carefully flip over your board, solder and clip the excess leads. Next, insert the 10 pin shrouded IDC header into the board, making sure to align the notch on the header, with the matching notch on the silkscreen. Then flip the board over, and solder into place. You can use a similar tactic with this header as with the IC sockets to get it flat. Next, carefully insert the ICs into their proper sockets. You may need to slightly bend the legs of the IC inward so that it will fit. When inserting, make sure to align the notch in the IC with the same notch on both the socket and the board. Failure to properly align ICs may damage the IC or other components. Let’s move over to the control board. Add 5 and 15 pin female headers to the PCB as shown below, turn over carefully and solder into place. Start by soldering only one leg of each socket. Then check to make sure everything is flat and straight, then continue soldering the rest of the pins. Add the standoffs as shown below and use two of the small Phillips screws to screw it in place. Now you are ready to flip the project over, and start inserting jacks into the other side of the board. Insert all of the jacks as shown below, do not solder yet. Once you have the jacks in, place the front panel over the jacks, securing down with the supplied 3.5mm hex nuts. Be careful not to put the panel on upside down! The 5 pin socket on the control board should directly under inputs 1 and 2. Once the front panel is secured, flip the project over so it is resting on the jacks, and GENTLY push on the back so that the board is flat and straight. When the panel and PCB are aligned and straight, you can solder up all the jacks. Congratulations! You’ve completed the MST ’07 Buffered Multiple! Start by plugging in a CV signal from a sequencer or a MIDI to CV module into INPUT A (top left jack inside a white box). Since INPUT 1 (top left jack inside a black box) is normalled to INPUT 2 (top right jack inside a black box), INPUT 2 normalled to INPUT 3 (bottom left jack inside a black box), and INPUT 3 is normalled to INPUT 4 (bottom right jack inside a black box) you can test all available 14 outputs. Plug a cable into a 1V/O INPUT on an Oscillator and plug the other end of the cable into Channel 1’s A Output jack on the MST ’07 Buffered Multiple. Make sure that each of the 4 “Channel 1” OUTPUTS, the 4 “Channel 2” OUTPUTS, the 3 “Channel 3” OUTPUTS, and the 3 “Channel 4” OUTPUTS are all making precise copies of the INPUT 1 signal by monitoring your Oscillator’s OUTPUT. Plug a cable into a 1V/O INPUT on Oscillator #1 and plug the other end of the cable into Channel 1’s A Output on the MST ’07 Buffered Multiple. Plug a cable into a 1V/O INPUT on Oscillator #2 and plug the other end of the cable into Channel 1’s B Output. From here it’s best to get both Oscillators in tune with each other so you can hear them both reacting the same way to the INPUT 1 signal. Make sure that each of the 4 “Channel 1” OUTPUTS, the 4 “Channel 2” OUTPUTS, the 3 “Channel 3” OUTPUTS, and the 3 “Channel 4” OUTPUTS are all making precise copies of the INPUT 1 signal by monitoring the OUTPUTS from both Oscillators #1 and #2. Keep the INPUT 1 signal plugged in from the previous test as we’ll break the INPUT normalling by plugging in a CV signal from another sequencer or a MIDI to CV module into INPUT 2. Plug in another CV signal into INPUT 3, and plug the last CV signal into INPUT 4. Plug a cable into a 1V/O INPUT on Oscillator #1 and plug the other end of the cable into Channel 1’s A Output on the MST ’07 Buffered Multiple. Plug a cable into Oscillator 1’s FM / MOD input and plug the other end of the cable into Channel 2’s A Output. Plug a cable into a 1V/O INPUT on Oscillator #2 and plug the other end of the cable into Channel 3’s A Output. Plug a cable into Oscillator 2’s FM / MOD input and plug the other end of the cable into Channel 4’s A Output. Make sure that each of the 4 “Channel 1” OUTPUTS, the 4 “Channel 2” OUTPUTS, the 3 “Channel 3” OUTPUTS, and the 3 “Channel 4” OUTPUTS are all making precise copies of their respective input signals by monitoring the OUTPUTS from both Oscillators #1 and #2. By now you should be able to confirm that all INPUTS and OUTPUTS are working correctly on the MST ’07 Buffered Multiple and that your unit is working correctly. Great module. Easy assembly. Excellent instructions. 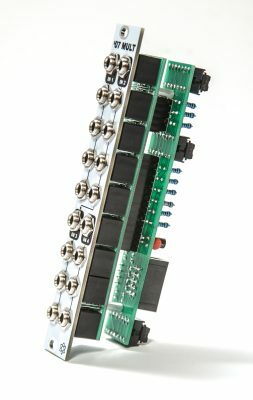 Really useful module especially in a large system where the buffering helps distribute signals and voltages to a number of modules (especially VCOs which are prone to “sag” without buffering.